Page revised in August 2018. Photos taken in September 2015 with Canon Powershot SX 700 HS. The two main temples of Paestum were dedicated to Argive Hera, i.e. Hera of Argos. Then in answer to Zeus spake ox-eyed, queenly Hera: "Verily have I three cities that are far dearest in my sight, Argos and Sparta and broad-wayed Mycenae" (Homer - The Iliad - Book IV - translation by A. T. Murray). 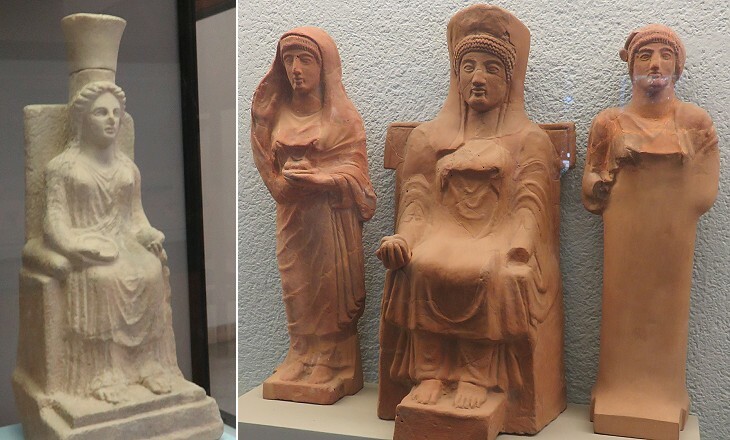 When we think of Hera (Juno) we tend to associate her with a jealous bickering housewife, but the Hera worshipped at Paestum, similar to Cybele in Asia Minor, was rather a mother than a wife, as she was directly linked to the early worship of mother goddesses. A Temple to Hera which resembles those at Paestum was built at Olympia near that to Zeus. In the 1930s archaeologists identified a sanctuary dedicated to Argive Hera near an ancient harbour of the town. It included hostels for pilgrims, temples, open-air altars, a treasury and other buildings. The complex was used from the VIth century BC to the IIIrd century BC. Its last buildings were made with materials, including decorated metopes, taken from earlier constructions. 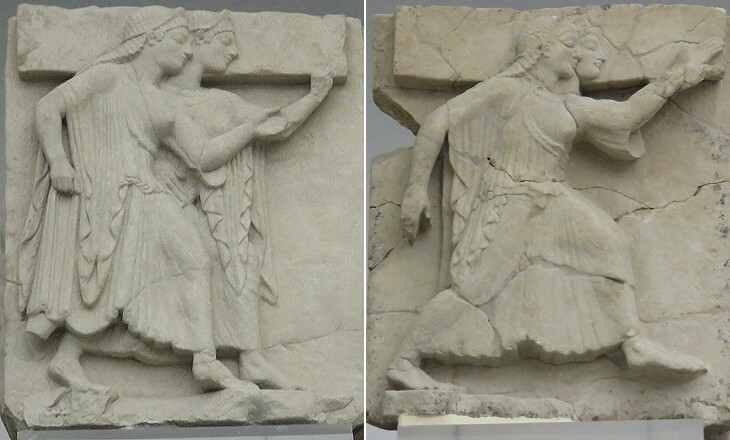 The so-called Major Temple was decorated with metopes portraying couples of dancing women, most likely a ceremonial procession. 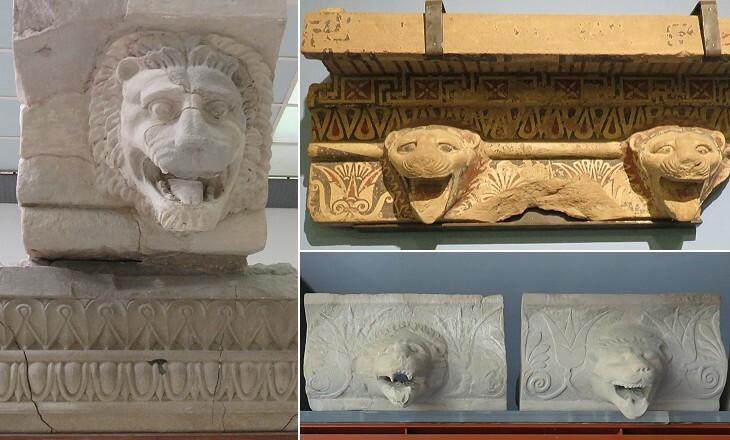 A number of metopes were found scattered in the area of the sanctuary. They most likely decorated other temples which are completely lost. They have been grouped by the subjects they represent. All the metopes were painted and in some of them the relief was limited to creating a projecting surface for the main subject to be painted on. 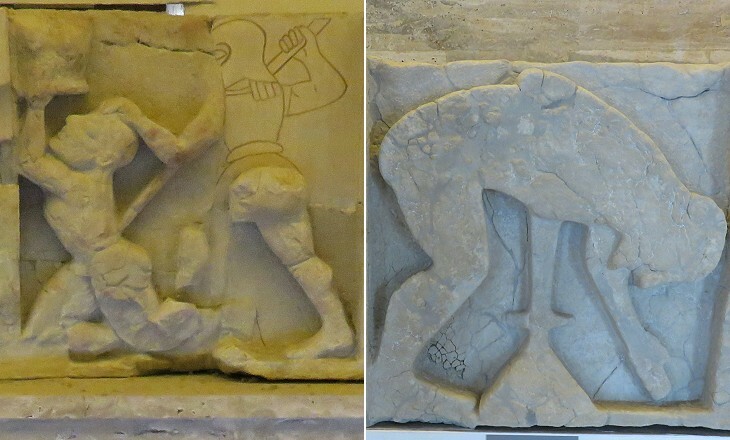 The image used as background for this page shows another metope portraying two archers. Patroclus was minded to destroy the Trojans. Three times that peer of swift Ares attacked them, shouting his dread war-cry, and each time killed nine men. But when, like a god, you charged at them again, Patroclus, then your fate loomed in sight. For Apollo met you, terrible in combat. Apollo advanced, veiled in a dense mist, invisible to Patroclus in the tumult, stood behind him and struck him in the back with the flat of his hand. The warrior's vision spun, as Apollo knocked the helmet from his head, sending it under the horses' feet with a clang, and the plumes on its crest were streaked with blood and dust. (..) The long-shadowed spear, thick, heavy and strong, and tipped with bronze, in Patroclus' hands was wholly shattered, the tasselled shield on its strap fell to the ground, and that blow from Lord Apollo, son of Zeus, had loosened the breastplate. Then Patroclus' mind was dimmed, his noble limbs were slack beneath him, and dazed he stood there. A Dardanian, Panthous' son Euphorbus, the best spearman, horseman and runner of his generation, who had brought down twenty charioteers in his apprenticeship in war, now cast his sharp spear and struck Patroclus in the back between the shoulders. (..) And Patroclus, stunned by the god's blow and Euphorbus' spear, retreated into the Myrmidon ranks, dodging fate. But Hector, seeing brave Patroclus withdraw, struck by the blade, made his way to him through the ranks, and drove at him with his spear, piercing the lower belly and ramming the point home. Patroclus fell with a thud, to the grievous sorrow of the Achaean army. As a lion in the high mountains may fight with a tireless wild boar over a trickling stream from which both seek to drink, and conquers his panting enemy by strength alone, so Hector, Priam' son, overcame the valiant son of Menoetius, who himself had killed so many men, and striking him close at hand with his spear robbed him of his life. The council of princes was swayed, and it shows what eloquence can do: the gifted speaker (Ulysses) carried away the arms of the brave hero (Achilles). But Ajax, who had so often stood alone against Hector, against sword and flame, against Jove himself, could not stand against mere passion, and indignation conquered the unconquerable hero. Drawing his sword he shouted: "This is mine, at least! Or does Ulysses demand it for himself? This I will use myself, on myself, and the iron so often drenched in Phrygian blood, will now be drenched in its master's, so that none can defeat Ajax but himself." He spoke, and drove the lethal weapon to its full extent into his chest, that, till then, had never felt a wound. Earth (..) brought forth the Giants, whom she had by Sky. These were matchless in the bulk of their bodies and invincible in their might; terrible of aspect did they appear, with long locks drooping from their head and chin (..). They darted rocks and burning oaks at the sky. Surpassing all the rest were Porphyrion and Alcyoneus, who was even immortal so long as he fought in the land of his birth. (..) Now the gods had an oracle that none of the giants could perish at the hand of gods, but that with the help of a mortal they would be made an end of. (..) Zeus (..) by means of Athena summoned Hercules to his help. Hercules first shot Alcyoneus with an arrow, but when the giant fell on the ground he somewhat revived. However, at Athena's advice Hercules dragged him outside Pallene, and so the giant died. Apollodorus - The Library - Book I - Translated by Sir James George Frazer. According to Diodorus Siculus (4, 31) the Cercopes dwelt in the vicinity of Ephesus and ravaged the country far and wide, while Hercules led a life of pleasure and servitude in the arms of Queen Omphale. In vain had their mother warned them to beware of the powerful hero. They despised her exhortations and Hercules in consequence was sent to chastise them. He soon brought them to the Queen loaded with chains. Only a few fragments of the decoration of the temples have been found. They mainly relate to the upper part of the cornice which was decorated with palm leaves and lion-mouthed water spouts. The quality of the latter in the Major Temple is very high. The most striking exhibit of the Museum was found in 1968 in a small necropolis south of the town. It is a sort of sarcophagus made up of five painted stones and a sixth one upon which the body was laid to rest. It is named after the painting of the lid/ceiling. The Diver's plunging into the water reminds of the passing of a river or of a marsh, an event which was associated with the transition to the afterworld. The two men portrayed on one of the short sides are perhaps symbols of youth and maturity. 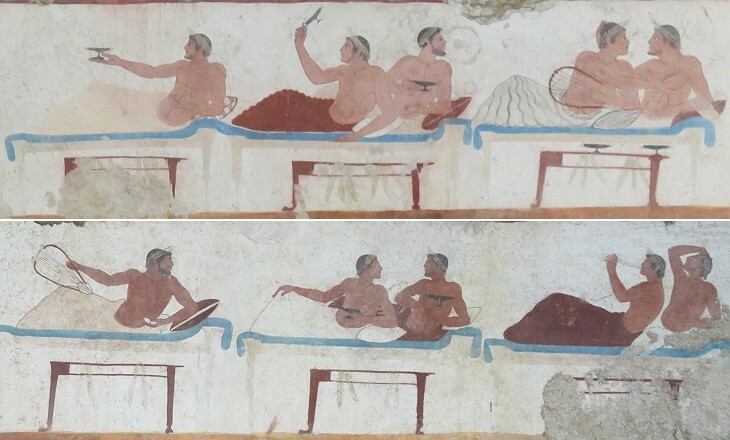 Ten young and athletic men play musical instruments, toast, chat, glance at each other and show signs of affection: this is a funerary banquet full of joy of living which is depicted on the two long sides of the tomb. The traditional Egyptian device of showing the torso in a frontal view and the heads in profile adds to the charm of the scene. 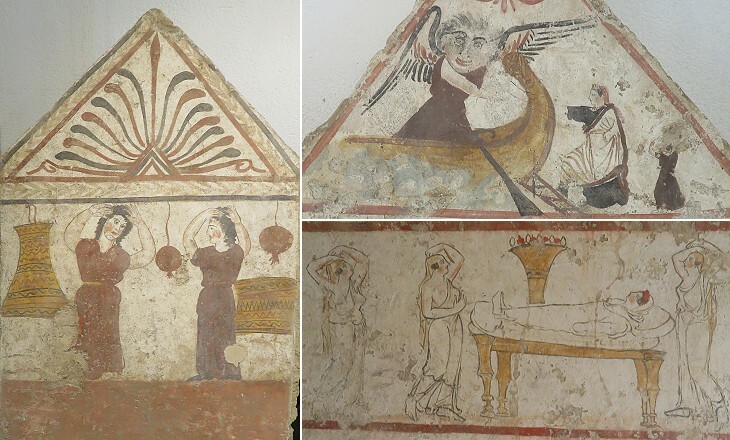 It would not be wise to infer too much about the lifestyle of wealthy Paestum citizens from this painting alone, yet it shows that changes in modern societies are not so dramatically new and scary as some say. You may wish to see a page on sarcophagi showing the dead at a funerary banquet. 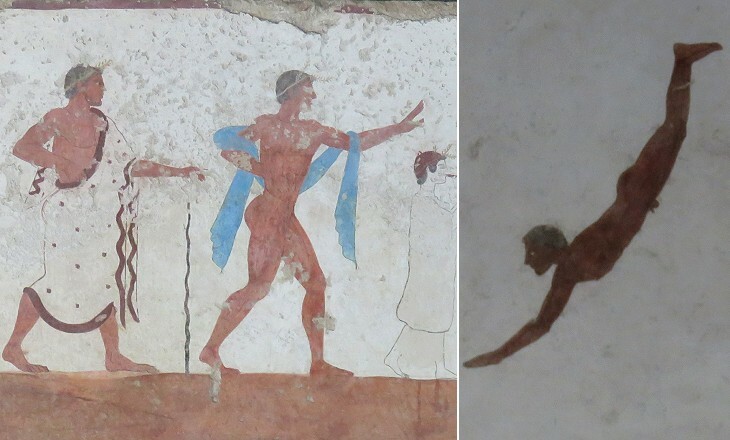 Tombs similar to that of the Diver continued to be used at Paestum for some centuries. They acquired the aspect of a doll's house when they were closed by a double lid resembling a gable roof. They were meant for inhumation and their size was large enough to contain the body and some funerary goods and utensils. Painters had a short time for the decoration of the panels and it appears they did their work in an awkward position when the "box" was already in place. This explains the sketchy appearance of some paintings and decorative patterns. They lined up for the start, and Achilles pointed out the turning post far off over the flat plain, where Phoenix, his father's squire, was placed as referee, to keep a watch on the race and judge their merits. As one, they raised their whips, shook the reins, and urged their teams on. Swiftly the horses galloped over the plain, leaving the ships behind. A whirlwind cloud of dust rose to their chests, and their manes streamed in the wind. Now the chariots ran freely over the solid ground, now they leapt in the air, while the hearts of the charioteers beat fast as they strove for victory, and they shouted to their horses, flying along in the storm of dust. Homer - Iliad - Book XXIII - Chariot races for the funeral of Patroclus - - Translation by Barry B. Powell. 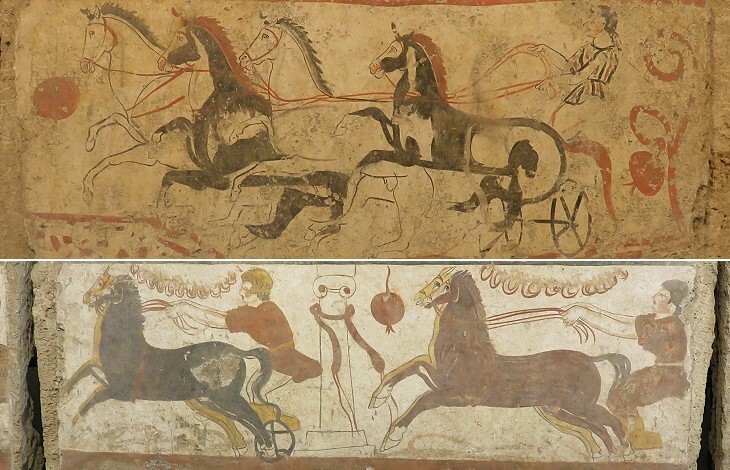 Similar to banquets, chariot races were part of the funerary rites for the most important men and this explains why charioteers were painted in many tombs. Achilles, son of Peleus, made his way through the crowd of spectators and set out the prizes for the boxing match. (..) "He whom Apollo grants true endurance in our eyes will return to his hut leading this sturdy mule, while the loser shall have this fine cup." At this a tall and powerful warrior stood up, a champion boxer, Epeius, son of Panopeus. He placed his hand on the mule, saying: "Whoever wants the cup, step forward. No man will beat me with his fists, and take the mule, since I'm the best boxer, I say". (..) Euryalus alone stood up to fight him, the son of King Mecisteus, Talaus' son, who at the funeral games for Oedipus, in Thebes, defeated every Cadmeian opponent. (..) When the two contestants were ready, they stepped to the centre of the arena, and raising their mighty arms, set to. Each landed heavy blows with their fists, and they ground their teeth, as the sweat poured over their limbs. Euryalus sought an opening, but noble Epeius swung and struck his jaw, and he went straight down, his legs collapsing under him. 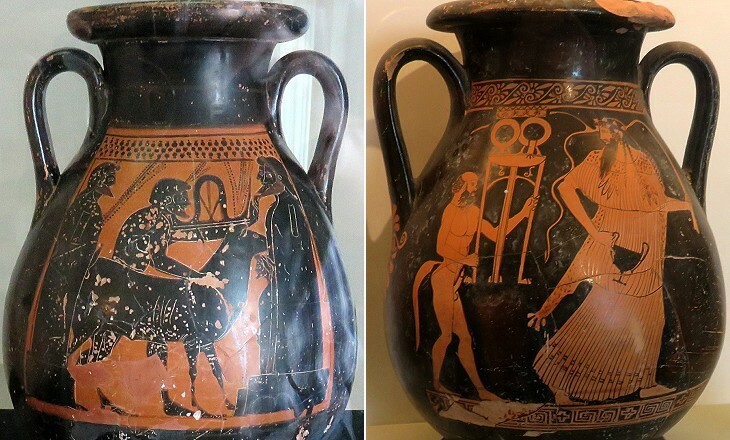 Now Achilles brought out a shield and helmet, and a long-shadowed spear, Sarpedon's gear that Patroclus had captured. Then he announced the next event: "Our two best warriors must arm, and fight each other for these prizes before the army, with naked bronze. I will give the one who first penetrates the other's guard and draws blood, this noble silver-studded Thracian sword I took from Asteropaeus, and the other arms they both can share, as well as a fine banquet in my hut. "At these words, great Telamonian Ajax and mighty Diomedes, Tydeus' son, leapt to their feet. 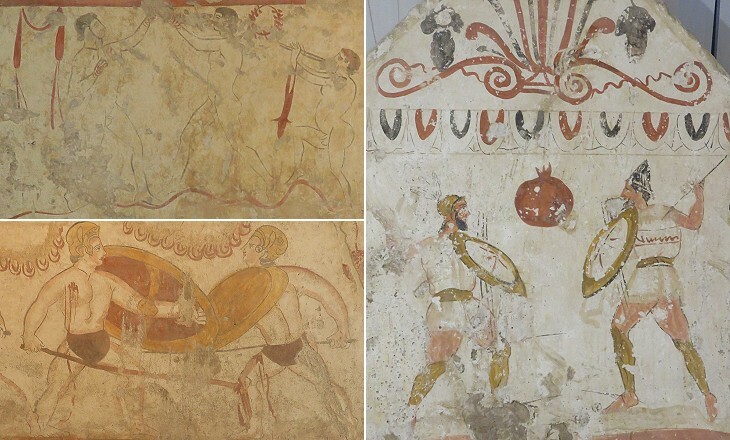 When they had armed themselves on their own side of the ring, they advanced to the centre, so menacing and eager for battle that the Achaeans held their breath. Closing, they charged three times and each time thrust at each other with their spears. Ajax pierced Diomedes' shield, but his breastplate kept the point from wounding him, while Diomedes kept thrusting at the rim of Ajax's shield, aiming for his neck with the point of his gleaming lance. Now the Greeks were so fearful for Ajax that they called an end to the contest and for shared prizes. However, Achilles awarded the long-sword to Diomedes, with its scabbard and its fine belt. Homer - Iliad - Book XXIII - Games for the funeral of Patroclus - - Translation by Barry B. Powell. Homer's account of the funeral of Patroclus is excellent source material to better understand the paintings of the tombs. A minor number of tombs were designed for women. Painters had to find appropriate subjects for them and those they chose were mainly related to the mourning of the death, which included women tearing their hair out, striking their breasts and chanting dirges. In one case a rich woman was portrayed while boarding Charon's boat to the world of the dead. 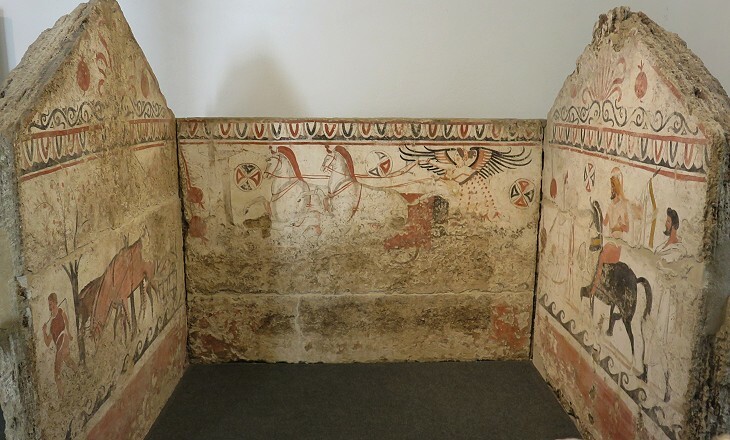 In many tombs pomegranates, symbols of Hera and of the last period of life, were painted as a decorative motif. A number of vases have been found at Paestum, mainly in tombs. 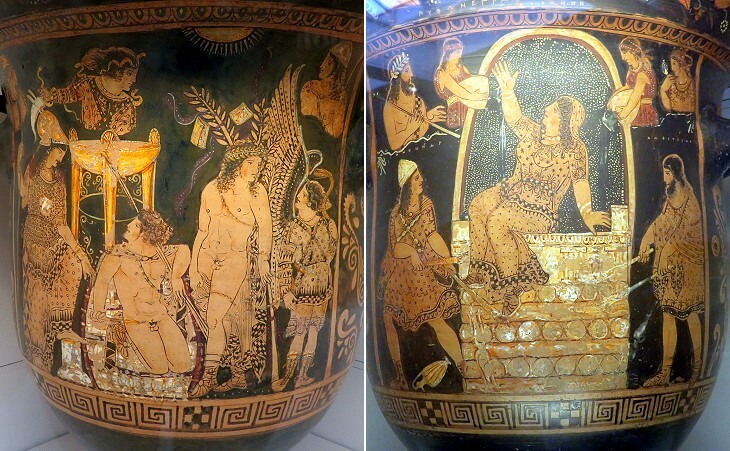 They cover a long period of time as they include both the older black-figure kraters and the newer red-figure ones. The latter were made in local workshops after the town had been conquered by the Lucani. 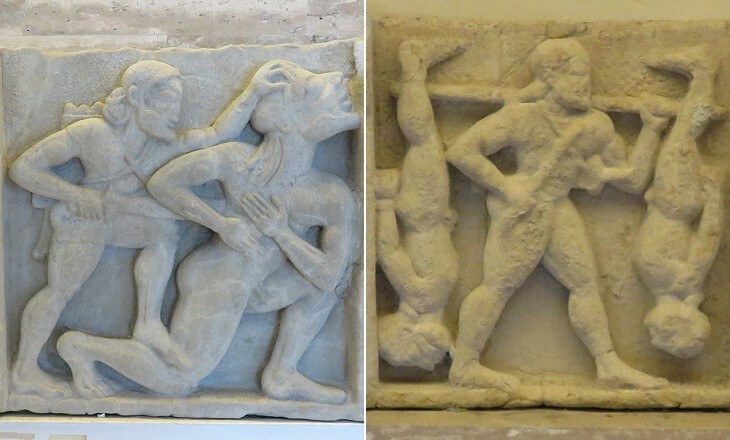 The subjects depicted on them however were those of the traditional Greek myth, including a Dionysus portrayed as a fully-clothed bearded man which is typical of the early worship of the god (you may wish to see a relief found at Ephesus).